If you enjoy being a cat owner, chances are you'll want to own more than one cat. There are good reasons for owning more than one. While cats are capable of thriving in isolation, most cats are social creatures that enjoy the company of their own kind. In addition, it can be very difficult for a single cat to do well when left entirely alone, as often happens when their humans go off to work or, more significantly, take an extended vacation. Even with a cat-sitter showing up from time to time, cats get lonely. Although sometimes cats will get along swimmingly in just a couple of hours, you should not be surprised to have a battle on your hands if you try to introduce your new cat too quickly. The time you spend on this all-important process will be saved exponentially by not having to break up conflicts every day. Also, the first couple of weeks can set the tone for the relationship for a long time to come, so "getting it right" the first time will save a lot of hassles later on. While it's not always possible to foresee how two cats will interact, there are some rules of thumb for selecting a cat or kitten to add to the group. If you already have more than one cat, use the "alpha cat" for preliminary introductions. Once he/she accepts the newcomer, the other resident cats will quickly fall in line. If you can, do your best to match personalities. For example, if you have a mellow, laid-back cat at home, chances are he'll be overwhelmed by an aggressive or high-energy housemate. If possible, ask a friend to deliver the new cat to your home, in her cage. You can act nonchalant as if it's no big deal, then later let your resident cats think it's their idea to welcome the newcomer. 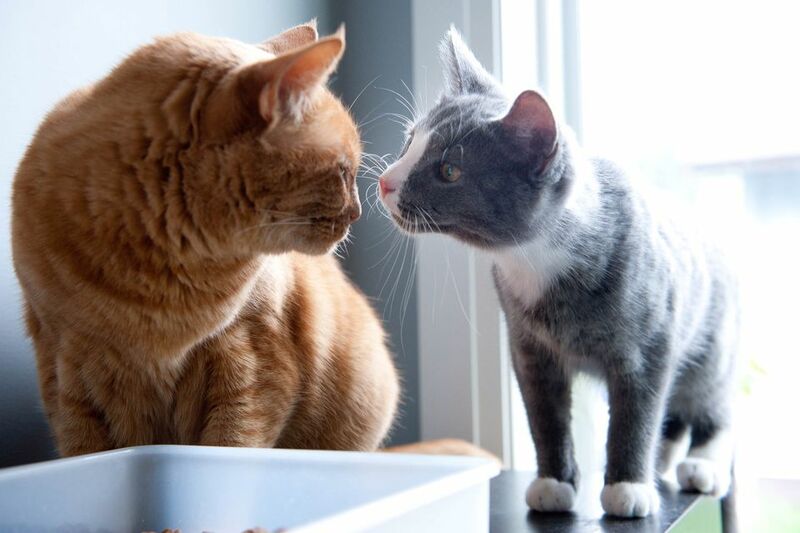 The process of introduction can take from two hours to six months, so don't be discouraged if your cats don't seem to get along well at first. Often the case is that they will eventually be "best buddies." Lots of snuggle time and attention is indicated for all cats concerned during this period. Remember, the prime goal is to get them to associate pleasure with the presence of each other. With patience and perseverance, you can turn what might appear at first as an "armed camp" into a haven of peace for your integrated feline family. Congratulations on giving another cat in need a permanent home! Do your best to follow these steps to help your new pet integrate successfully into your household. Remember to give both cats plenty of praise and attention, and don't forget to continue with any routines you've established with your existing pet. Set up a comfortable "safe room" for the new cat. Put its food, water, litter box (not near the food), scratching post, toys, and bed or another sleeping mat there. Expect a great deal of "hissy-spitty" behavior through the closed door from both cats. This is natural and normal; they are just starting to explore their "pecking order." The scent is very important for cats. Let each of them smell the other indirectly, by rubbing a towel on one and letting the other smell it. They will soon accept the scent as a normal part of the house. Once or twice, switch roles. Put the new cat in the normal living quarters, and let your resident cat sniff out the new cat's safe room. After a day or so, let the two cats sniff each other through a baby gate or through a barely-opened door. Gauge the rate at which they seem to be acclimating to each other. When you think they're ready, let them mingle under your supervision. Ignore hissing and growling, but you may have to intervene if a physical battle breaks out. Again, take this step slowly, depending on how quickly they get along. If they do seem to tolerate each other, even begrudgingly, praise both of them profusely. If things start going badly, separate them again, and then start where you left off. If one cat seems to consistently be the aggressor, give her some "time out," then try again a little bit later.